During the meeting, a handful of critics voiced complaints about the sanitation district’s lack of transparency and its apparent ongoing disregard for the Ralph M. Brown Act, a stringent California open-meetings law that requires legislative bodies to conduct their business in public view in the boundaries of their government body. 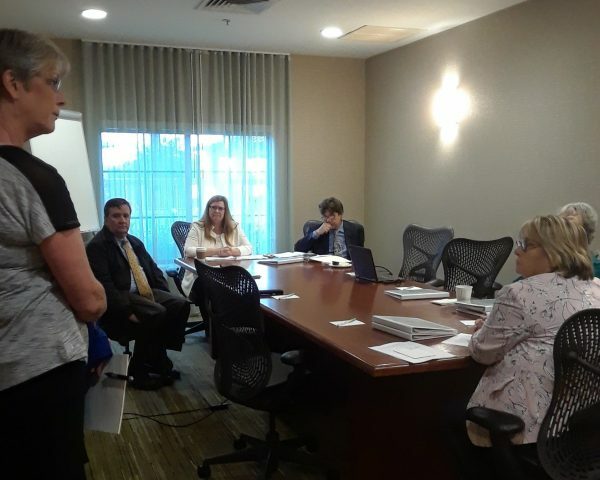 The charges claim, among other things, that the sanitation district held a closed session meeting on Saturday at the Courtyard Marriott in San Luis Obispo, outside the boundaries of the district. At the meeting, staffers said they moved the location to utilize Skype during what was dubbed a teleconference meeting. The Brown Act permits teleconference meetings if a quorum of members are physically in the government bodies jurisdiction and if the agenda is posted at the site. 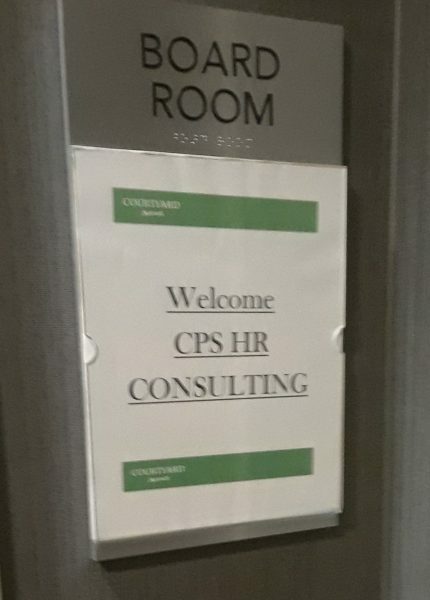 In this case, no members attended the meeting in the district boundaries and an agenda of the meeting was not posted at the Courtyard Marriott. Posting of sanitation district meeting at Courtyard Marriott. During public comment, citizens warning board members Linda Austin from Oceano and Barbara Nicolls from Grover Beach that they should cancel the meeting to avoid violating the Brown Act. Several speakers accused sanitation district officials of moving the meeting out of area to avoid public scrutiny. After public comment, interim Administrator Rick Sweet read an email from district legal counsel Gil Trujillo, that said the out of district boundary location was in compliance with the Brown Act. After dismissing the concerns of Mayor Hill and others, board members Nicolls and Austin, a consultant and Oceano General Manager Paavo Ogren moved the meeting into closed session to interview applicants to replace the district’s former administrator. Gerhardt Hubner left the district in Aug, 2017. The Ralph M. Brown Act was passed in 1953 because of mounting concerns that government bodies were avoiding scrutiny by meeting secretly. The act, which has been amended and strengthened in the years since, guarantees the public the right to attend and participate in meetings of legislative bodies, to have forewarning of discussion items through posted agendas, and forbids a majority of board members from discussing government issues in private. I wonder why Paavo Ogren was there? To whisper in Linda Austin’s ear? The cavalier lack of interest in open government on the part of board president Linda Austin and vice president Barbara Nicolls is entirely in keeping with the behavior that gained scathing reviews from the grand jury, the public, the Knudson report and resulted in a criminal conviction of the District administrator and engineer, John Wallace. The South San Luis Obispo County Sanitation District has to win the award for being the heart of the swamp. The South San Luis Obispo County Sanitation Board is betraying ratepayers, and Arroyo Grande Mayor Jim Hill was correct in boycotting their illegal meeting. There you have it, two directors, Linda Austin and Barbra Nicolls, willing to break the law and exclude public testimony for their political reasons, with overpaid bureaucrats Gil Trujillo and Rick Sweet happy to go along with them. Both Austin and Nicolls ought to be recalled from office, and these two overpaid bureaucrats, Rick Sweet and Gil Trujillo have had problems like this where they previously worked in Santa Maria. I believe both of faced troubles and the ire of the public for their incompetency. Federal and state government have virtually no accountability to the citizens and local government would also like it that way. It’s time for the steeple to stop letting them divide us like steeple into democrats and republicans and fight amongst each other. Only when people realize that private citizen vs govt oligarch is the true division in this country will change occur for the better. Sheeple not steeple…damn this auto spellcheck.